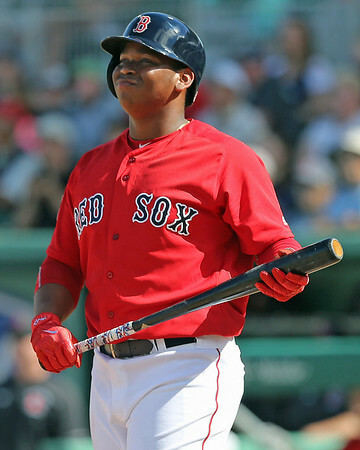 The Sea Dogs won their fifth straight, even with both of Rafael Devers' hits staying inside of Hadlock Field. After hitting two home runs on Tuesday, and collecting another hit on Wednesday, the 20-year-old stayed hot at the plate with a 2-for-4 night. Joseph Monge and Danny Mars both doubled and drove in a pair of runs, while Nick Longhi reached base three times on a single and two walks. An 0-for-3 evening ended the 15-game hitting streak of Tzu-Wei Lin. Teddy Stankiewicz turned in a solid start for the win, allowing two runs on eight hits in six innings, striking out five against just one walk. Jake Cosart continues to struggle with his control. The right-hander walked four in 2/3 of an inning, surrendering two runs despite not giving up a hit. It was the second straight outing with four walks for Cosart, who has 18 in eight innings on the season. Austin Maddox earned the save with 2 1/3 shutout innings, giving up just one hit. Unlike Carolina League pitchers, the rain has the ability to keep Michael Chavis hitless. A doubleheader is scheduled for Saturday. I ran out of clever ways to say "the game got rained out" about two weeks ago. They'll try again on May 20 as part of a doubleheader. Player of the Day: Teddy Stankiewicz continues to turn in solid performances out of the Portland rotation. He has gone at least six innings in each of his five starts this year, giving up two or fewer runs in all but one. The five strikeouts matches a season high, and he lowers his ERA to 3.19.